Each year, about 1 million children are reported missing throughout the United States. Of these, more than 100,000 children go missing for an extended period of time. Rev. Ira Acree, pastor at Greater St. John Bible Church, had his very own niece become one of our nation’s missing persons. 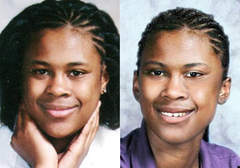 Yasmin Acree was a 15-year-old honor student when she disappeared 10 years ago. The teen disappeared on MLK Day in 2008, something her uncle now calls cruel irony. She was living in Austin with her aunt who had adopted her. After spending the day at the West Lawndale YMCA, Yasmin was dropped off at home around 8 p.m. Jan. 16, 2008. She was never seen by her family again. We are setting up a program much like the Guardian Angels on the West Side. We are working with Shannon D. Callahan, a member of New Yerusalem Lodge #158 F & A M – PHA, and we will be meeting with Chicago Police Supt. Eddie Johnson to put a program in place. 1. Remind your children to never ride with strangers under any circumstances. Teach them specific procedures about who will pick them up at school in case of an emergency. Use a code word that only you and your children know. 3. Impress upon your children that they should tell you immediately if anyone or any incident has made them feel uncomfortable, especially if it involves touching. 4. Remind your children not to play in isolated areas, to always travel in groups with friends, and to never travel or go to the bathroom alone or in the dark. 5. Teach your children how to lock and unlock doors and windows. 6. Teach your children what to do if they become separated from you at the grocery store, zoo, museum or any other place away from home. Act it out with your children, so they know exactly what to do. 7. Tell your children never to take candy, toys or money from strangers. 8. Help your children learn their address and telephone number, including the area code. 9. Help your children memorize emergency phone numbers. 10. Parents should review their school’s absence policy. Ask the school to call immediately if your children are absent without an excuse. 11. Keep up-to-date photographs of your children with their ages, heights, weights, etc. written on the back. A current digital recording of your children is even better. 12. Have the police fingerprint your children. Do not use home fingerprinting kits, as they are not accurate. Keep several copies of your children’s fingerprints in a safe place at home. 13. Do not put your children’s names on the outside of clothing. This prevents a stranger from addressing them by name and acting like they know them. 14. Record your children’s birthmarks, moles, warts, scars and distinctive characteristics. Rep. La Shawn Ford represents Austin in the Illinois House.